DTMRI (high resolution diffusion tensor magnetic resonance imaging) of ex vivo tissues has the potential power to reveal detailed structure and fibre architecture that may not be visible using in vivo acquisitions. Dr Pervolarak and her research team from both University of Leeds and Edinburgh have used such protocols to visualise the human foetal heart through gestation and have developed computational tools for representing its structures graphically. In two previous papers (Pervolaraki et al, 2013; Interface Focus; Pervolaraki et al, 2014; Europace) they had concentrated on describing different MRI protocols and their benefits in mapping the development of the human heart and how structural changes connect to its activity and possible triggers for selected pathologies. High resolution visualisation of the structure and tractographic representation of the fibres in the developing human heart, Pervolaraki et al), they present an example of a human foetal heart at 20 weeks gestational age that was imaged at a 100 µm cubic voxel resolution, using a standard DTMRI protocol in a 9.4 tesla Bruker NMR (as in Pervolaraki et al, 2013; Interface Focus). The MRI data is visualized in 3D providing different ways of presenting its structure, as a surface view (panel A) or a transparent wireframe (panel B). Panel C presents a long axis slice through the heart, where the local average myocyte orientation is visualized by a two-dimensional colour map of the fibre helix angle, illustrating the smooth transmural change in fibre orientation, and panel D illustrates a slice through the 3D projection of the streamlines of the orientation vector field. Images were produced using open-source packages ParaView (www.paraview.org) and DSI Studio (www.dsi-studio.labsolver.org). Dr Pervolarak and her research team have previously presented the smooth transmural helix angles (as in panel C) of a human heart during development (as in Pervolaraki et al, 2013; Interface Focus), but this is the first time they worked to computationally map the cardiac network of fibres using tractography (panel D). This computer based image analysis method has been used to visualise neural tracts throughout the brain and it has mapped the network of connections among cortical and cubcortical regions. 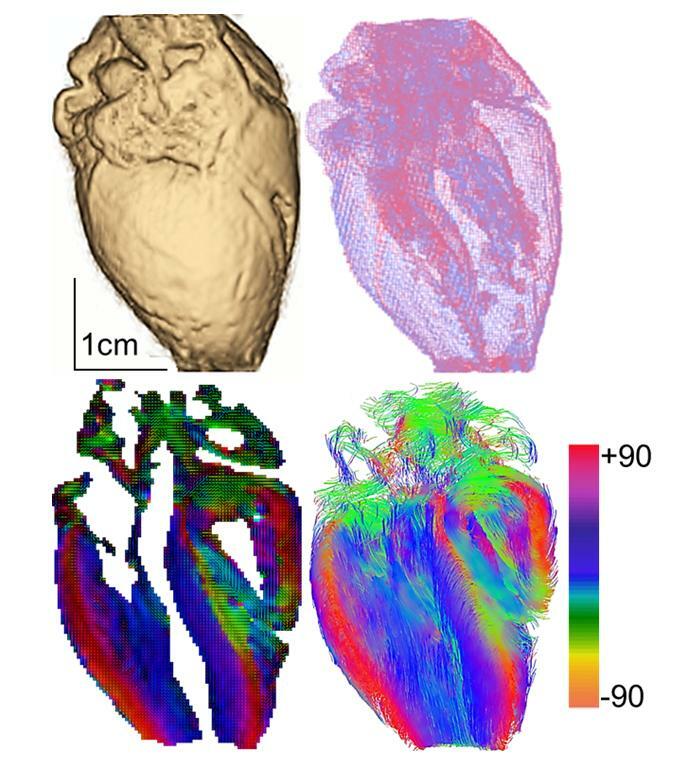 Similar simulations can help understanding the development of the human heart and explain how these fibres may be altered during pathological conditions.